FRONT OF RIGHT SHOULDER THERE ARE 4 HOLES AT THE SHOULDER SEAM, AND A STAIN ON THE SHOULDER ITSELF WITH SOME SMALL PIN HOLES. 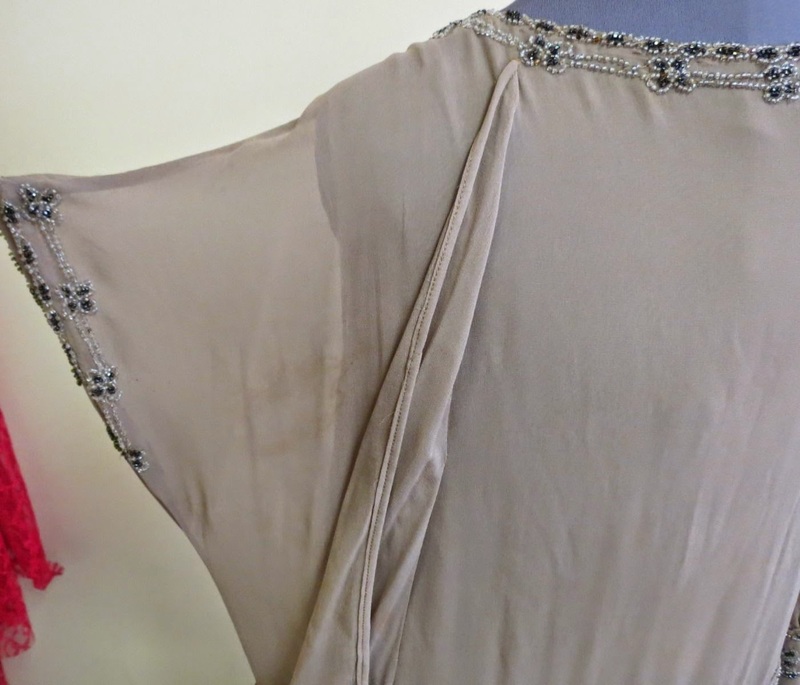 A RIGHT SHOULDER ON THE BACK OF THE DRESS THERE IS A STAIN BY THE SLEEVES EDGE. 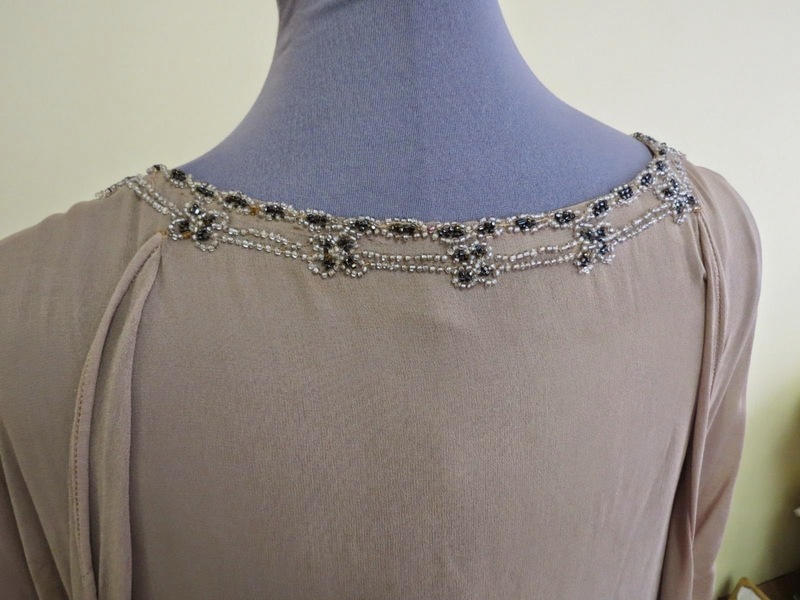 ON THE FRONT OF THE DRESS THERE IS A STAIN AT THE BEAD WAIST AREA LEFT OF CENTER. 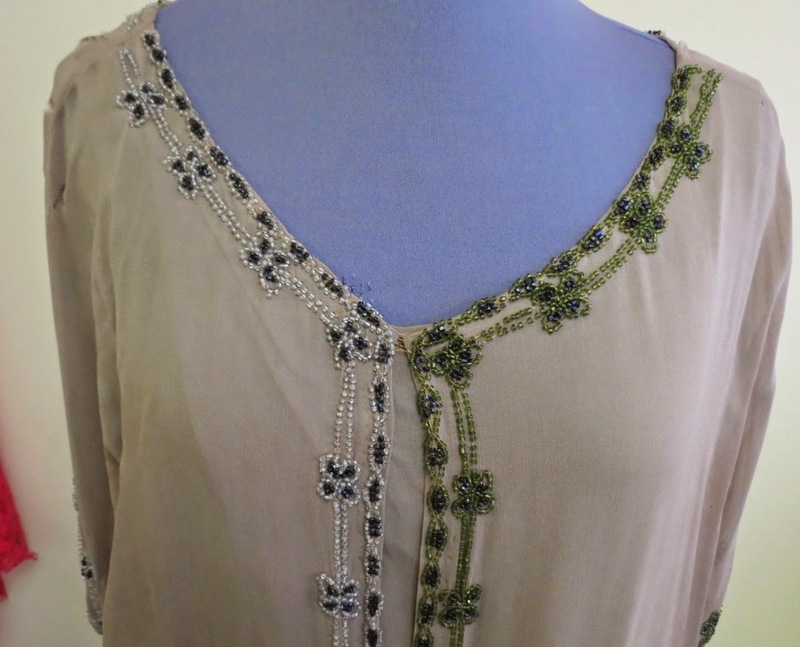 LEFT SHOULDER FRONT, THERE ARE SEVERAL SMALL HOLES AT THE SHOULDER SEAM LINE, A STAIN WITH PIN HOLES ON THE FRONT SHOULDER CHEST AREA. LEFT SHOULDER ON THE BACK THERE IS A STAIN WITH 3 HOLES, AND 4 PINHOLES BY THE EDGE OF THE SLEEVE. 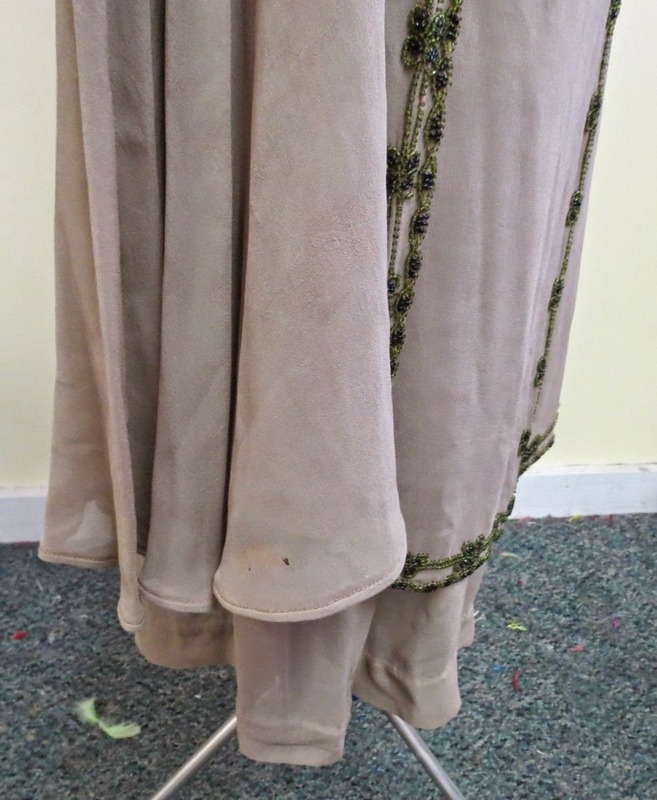 ON THE BACK OF THE DRESS, THERE IS A STAIN ABOVE THE WAIST LINE LEFT SIDE AND A YELLOW MARK TOWARDS THE RIGHT SIDE. 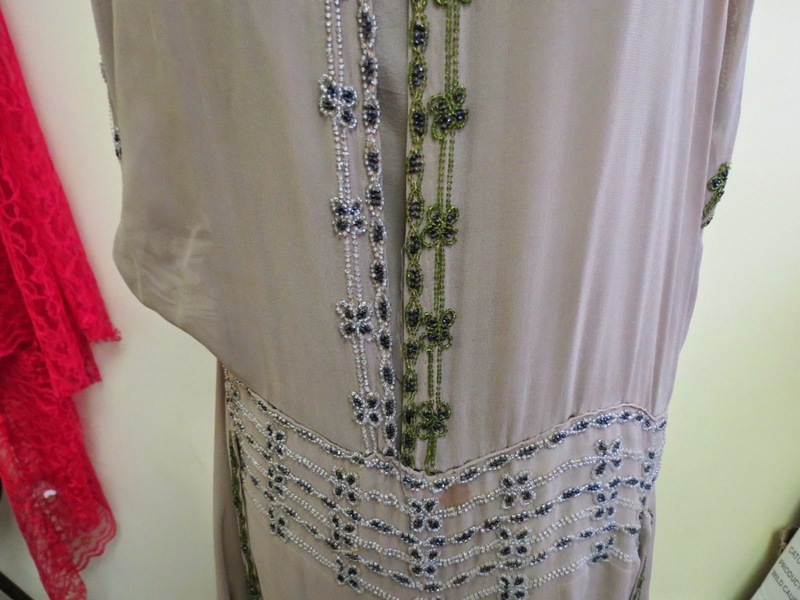 THERE IS ALSO A TEAR WHERE THE BEADED PANEL ATTACHES TO DRESS. 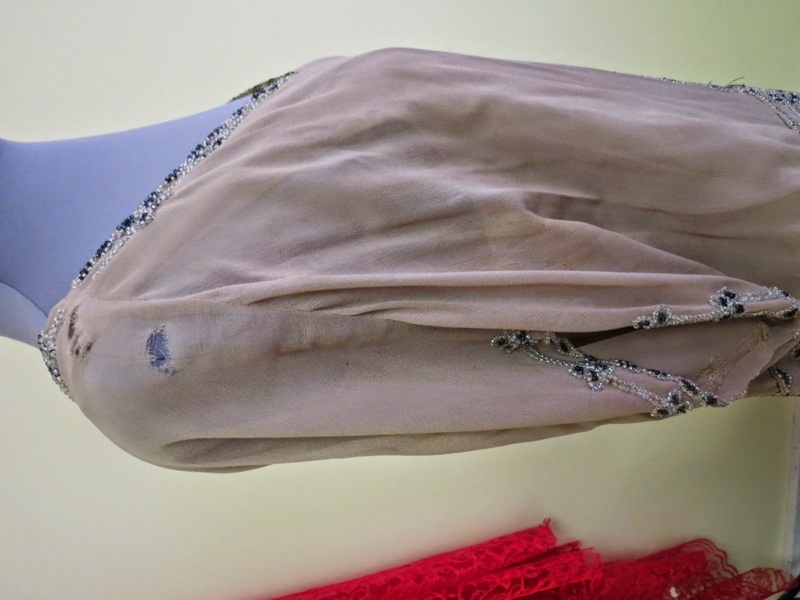 ARMPITS OF THE DRESS ARE STAINED AS WELL, SOME RAVELING AND LOOSE BEADS DOWN THE FRONT OPENING. Remember to double the measurements when you read them - they were taken flat across, not around. 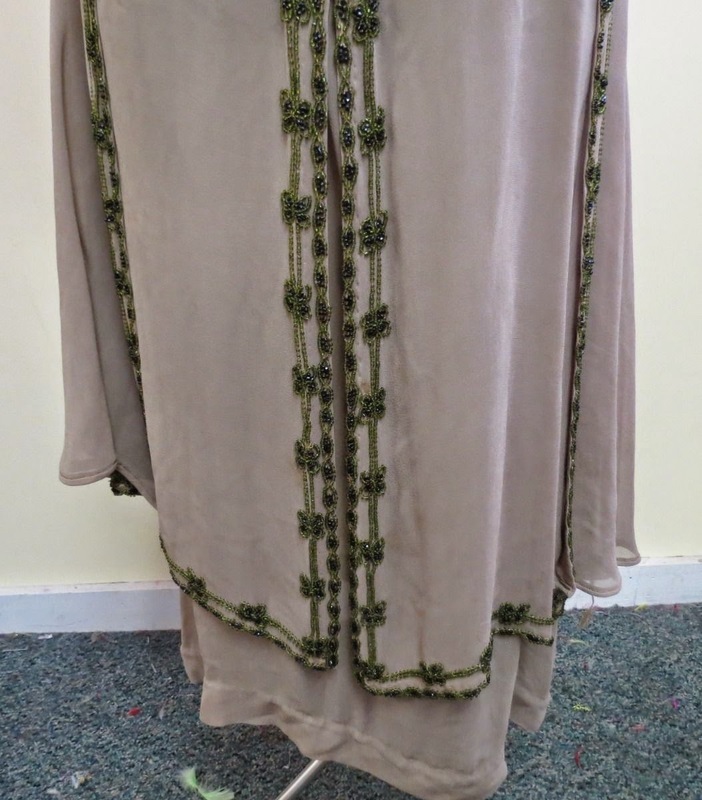 I find the beading interesting - I'm curious if the "gold" beads to one side are intentional or not. Since they aren't mixed with the "silver" ones to the other side, my guess is that the two tone beading was on purpose. I'd put this one at 1919 at it's earliest but more towards 1921 for it's most common.